This is so important. 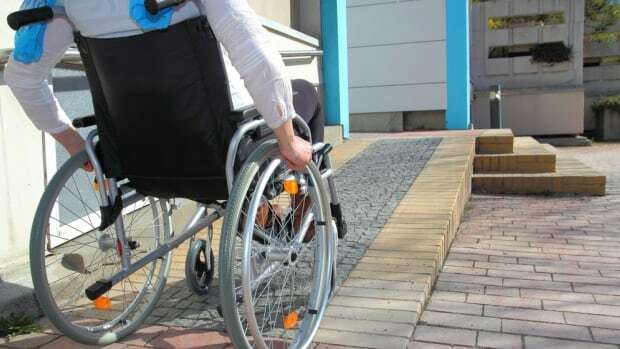 I wrote this for every kid who has broken a leg (I have) or had any sort of disability, short or long term, that makes gaining access to school difficult. I feel so lucky to have had a place to submit this essay, because, well, we all deserve equal access to education, no matter how we get there. Bermuda bag! On sale now! Some time ago, I wrote this book, Knit Green: 20 Projects and Ideas for Sustainability and I designed some knitting patterns to go with it. It worked out that I could offer some of the patterns as downloads online...but for one reason or another, some of these designs were not available, aside from purchasing the book. Yesterday, I was able to fix that! Now, the basic Bermuda bag and the Pin Check Bermuda Bag are both available for download on Ravelry, and also available on Love Knitting. 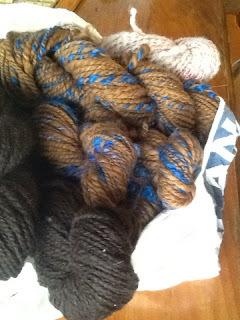 If you buy them both on Ravelry before the end of February, you can get $2 off, too! When I was a kid, I had one of these bags and I loved how "matchy matchy" it made everything...and it also seems like a perfect, vintage but new sort of thing....never really out of style or out of date. Unfortunately, I am not able to carry one of these things now and hold onto the hands of both my twins in school parking lots, etc. so for now, I'll just have to say how cool they are for everybody else. 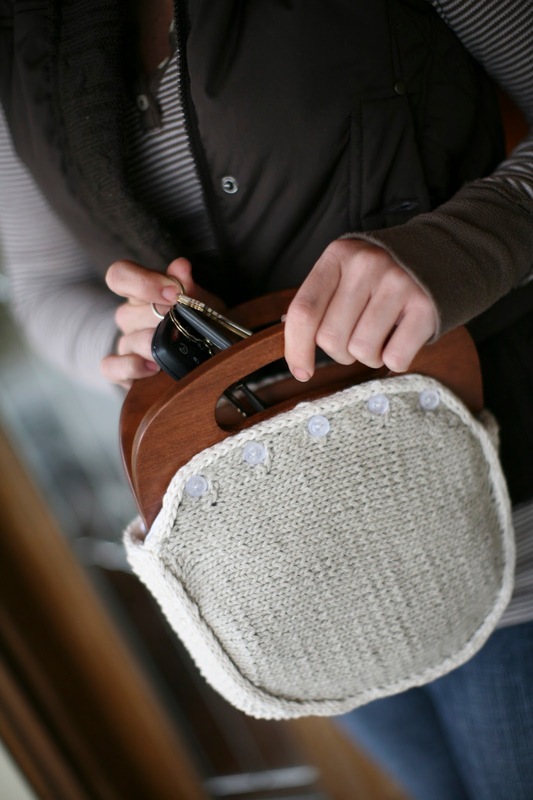 :) And, imagine how neat it would be to knit matching covers for your outfits! Cool! Just today I saw this field bag and these these bento bags--I tell you. I feel seized by irrational desire. I think I am subconsciously trying to contain clutter this way. Our house is filled with clutter. Piles! Stuff everywhere. And, you know, I'd like to be one of those zen tidy people, but I am not. However, a good container...a good bag...well, it makes all the clutter appear to go away for a while. Ahhh. That's better. Yesterday, I took a new handmade enormous wooden crochet hook I'd picked up at Ram Wools and I made something...a while back, someone passed along some old sheets and remnants her mother had saved, and said she thought I'd find something to do with them. I contemplated getting rid of the box several times, but held out. 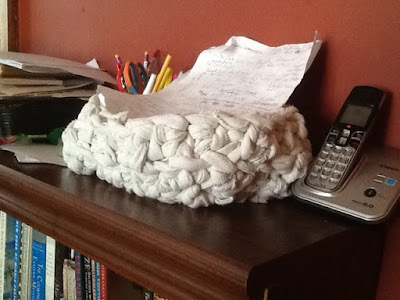 I'd cut and ripped one threadbare white sheet into a big ball of fabric yarn a while back. Here it is in its new incarnation....it holds all those bits of paper with phone numbers scribbled on them, all those business cards that littered this area near the phone in our dining room until recently. We are old school--we still have a landline, with a pile of phone numbers near it. 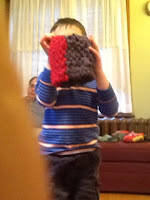 Now they have their own crocheted container/basket thingee. It's not a fine job, I'm no professional when it comes to crochet...but it is tidy for the moment. Ahhh. Bags. Containers. I see a green ripped sheet in my office, and I'm imagining its future now. If we can only contain it all? Maybe I won't have to go through it or throw it all away?! I'd want to point out, of course, that good teaching is crucial, but it is only one part of this assessment; we have no idea if Manitoba's students' test scores are representative of their skills, if the tests done were biased, on and on. There are a lot of unanswered variables in social science, but, well, this is only one essay about the U of Manitoba's faculty of Education's new diversity admissions policy. The best part of it all, I felt, was reading the (as usual) mostly knucklehead comments, which sort of illustrate why a diverse, effective teaching force is a good thing. (in aiding tolerance, for instance, which was seriously lacking in some comments) Then there was one absolutely erudite comment about the certification standards from a really qualified Manitoba teacher, educated in Britain. That made my week. 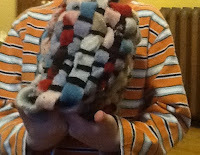 Other things that are making my week... We have completed our first weaving, with a lot of Mommy help. These were done on picture frames, using loopers cut from wool socks with holes in them. 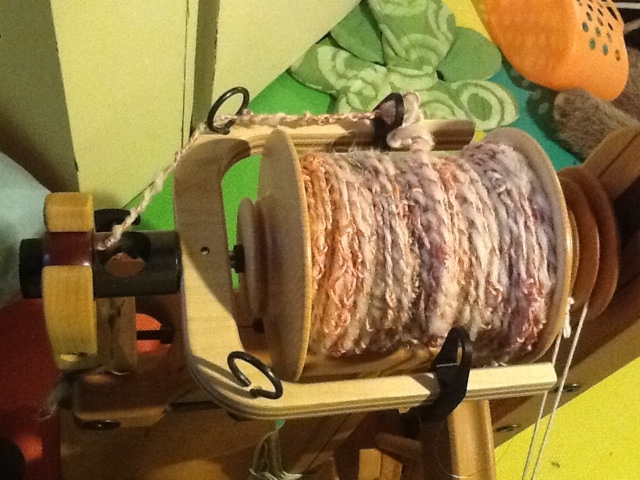 The warp was cut up felted sweater strips, leftover from all the wool soakers I made for cloth diapering. We've had perhaps another 2 or three more preschooler viruses since the last time I posted...digestive issues, colds, coughs...; to be honest, I've lost track. I have become remarkably zen about the whole thing. When someone is too sick for preschool, or needs to come home, I take a deep breath, drop all my plans...and just resign myself to returning to the couch with whoever needs me. I've not done a lot of things this winter. Oh well. The house is pretty mucky, too. I'm thinking of trying to clean up this week, since Didi (my mom, twins' grandma) is coming to visit, but I don't have high expectations. It doesn't help to expect too much, cause then I feel upset with myself when things are back to basics all over again. Perhaps because of the great retirement sale at Shuttleworks or maybe just because I needed a pick-me-up, I decided to go crazy and order the bulky flyer set ups for both my Schacht Matchless spinning wheel and my Majacraft Little Gem. Maybe it was my Valentine's Day gift to myself? This is, I think, my first big wheel-related purchase in maybe 8 years. It's been a bit of adjustment to figure out how the new things work, but it's exciting, too. 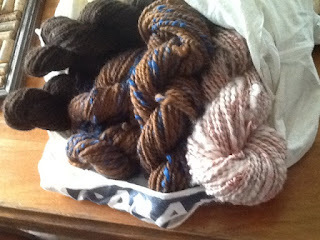 I see very big skeins of handspun in my future...someday! 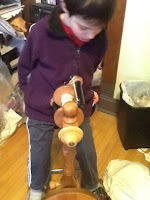 Before I switched the flyers on the Majacraft, I amazed this kid, home sick, by whipping the wheel out of its carrying case and setting it up so he could check it out. He was stunned; I don't think he had ever seen how it folded it up before. He got to treadle and do some wool teasing, which he enjoyed. 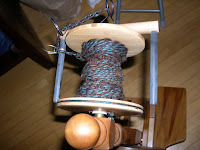 (fluffing up locks of wool into clouds for spinning.) I was rewarded for all this with a seriously firm admonition to "Clean up, Mommy, your office is very messy." He then offered helpful hints. Great. Thanks, kid. 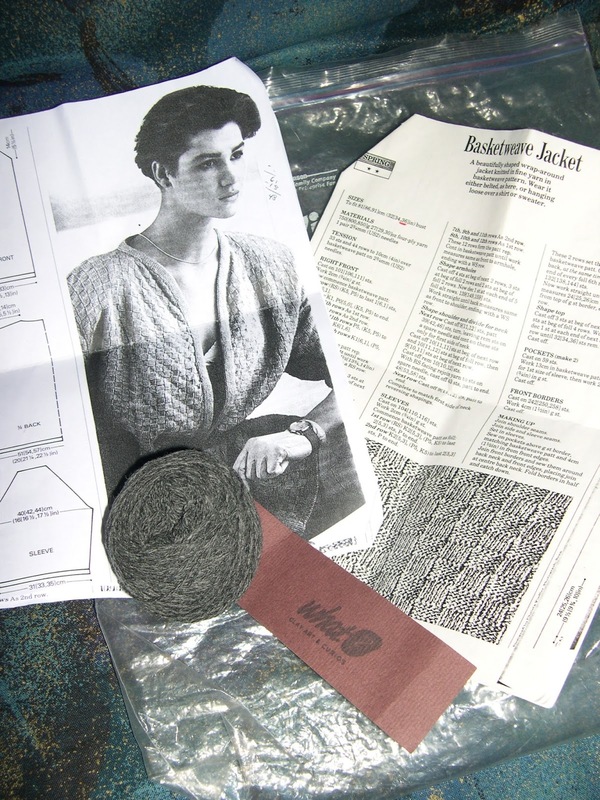 Finally, I am planning to relaunch some older patterns and reknit some too, this year. 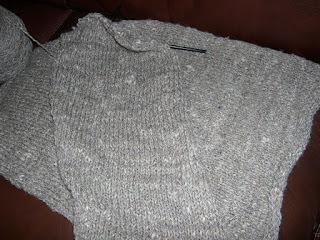 I am also working on a sweater for myself, the third time I am reknitting the Cuddle Coat. Honestly, this sweater design has a curse, it has never had a decent photo of it. However, the first one (in my little headshot, that is #1, with Harry the dog) is so worn that I have to mend it, the second one was trashed after it was absolutely worn to pieces, and here's the third. Yup. 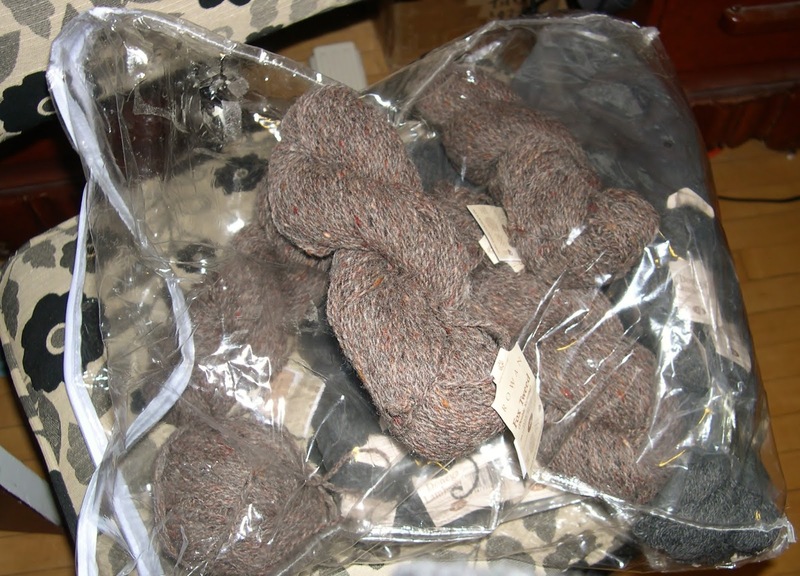 That is some boring looking gray/brown knitting! If you click on it though, you may see the texture, little bits of color, and softness of the yarn. Feels great. Looks just like? February. Yesterday seemed like a big day; a soaring end to a good week...my twins were back at preschool all week. 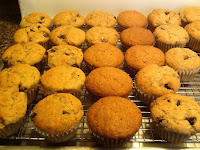 I had time to work and even make banana chocolate chip muffins. 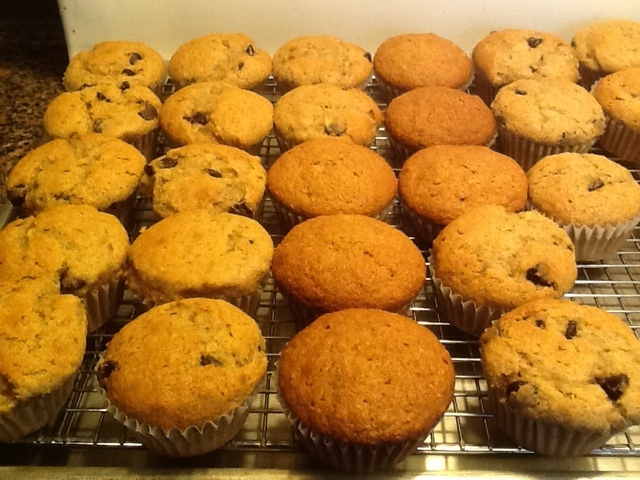 (full of spelt flour, oats, and other secret healthy bits) We had a really fun children's program at synagogue Saturday morning, everyone seemed good. and today we are having a blizzard warning, so it seemed like great timing. I also was quoted in a Winnipeg Free Press article, called Wool Warriors:Knitters use their craft to campaign for change. The online version is different from the one in the newspaper...the paper actually features a photo of me as well! I was proud to see the focus on knitting as an activist enterprise, full of political and social repercussions...and it linked in nicely to what I heard at Ram Wools when I visited the yarn shop a couple of days ago...the campaign to provide handknit woollies (and other warm clothes) for newcomers to Canada has reached something like 1800 pieces, very nearly reaching its goal of 2000 items. Another way knitting makes positive change for the world. It was foreshadowing. We got home yesterday, had lunch together, and I put both boys down for a well-deserved nap. By 2:30, the first kid was wide awake and screaming...and the stomach bug was back, with a vengeance. I was up nearly all night with the second kid while he was ill. So, you know, just when things seem awesome and I'm too big for my britches, it is an important time to stay humble. Cause there were at least three sets of bedding to change, and kids to mop up and comfort. Cause this part, the virus part, is real life, and the other stuff? Not nearly as likely to happen again any time soon... Oh well. If you're local, this yarn might be waiting for you at Ram Wools on Portage Ave...but maybe wait until tomorrow, when the winds and snow die down and the yarn shop opens again?! 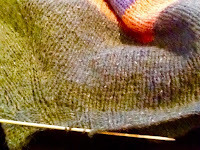 If you've been a knitter for any length of time, this might have happened to you... one of my husband's work colleagues is a knitter. Her knitting friend passed away. Friend's husband gave the Professor's colleague some knitting. One day, the Professor speaks with her in the hall, and she asks if I might help with it. Then, my husband -the Professor- brings home a package. First, there were a pile of needles, which I gave to a local yarn shop so they could use it in their teaching and charity programs. Also in the pile was this pattern, a Basketweave Jacket from an Elle magazine book publication from 1986. In the pile of yarns were a bunch of dark gray skeins of Rowan Donegal Lambswool and some skeins of tweedy brown Rowan Fox Tweed. 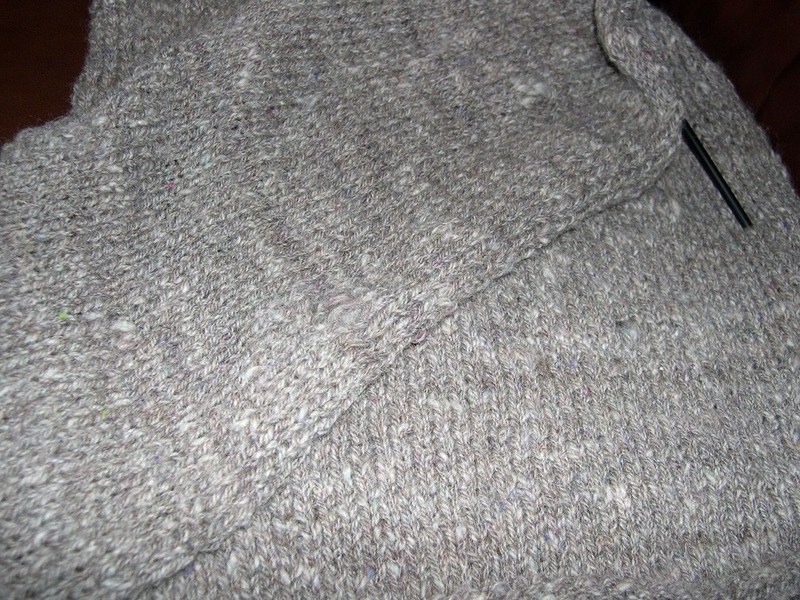 Also, two fronts and one back of a vest, with the 2.5mm needles still stuck in the knitting. However, when I looked at it, I saw I could just finish the row, cast off, sew up the seams and the vest would be nearly made. I wouldn't make it like the 1986 vintage pattern, but I'd have a vest...to wear, if it suits, or to give away. I dug around until I found the right button. This button was given to me at a Manitoba Craft Council sale in November of 2010. (I remember because I was a vendor at the sale, trying to sell handwoven rugs, newly pregnant with twins, terribly ill with morning sickness, and we had a plumbing disaster that weekend. Oy. How could I forget?) Anyhow, this button is handmade by Evelin Richter, and it totally matches. Obviously, it was waiting for this moment. 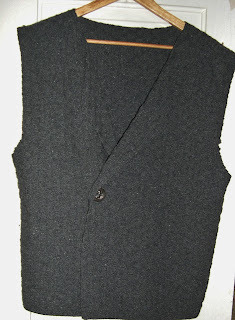 Anyhow, bing bam boom (as all those kids' cartoons say...), here's a vest. I haven't worn it yet, but it is really a fine piece of knitting. 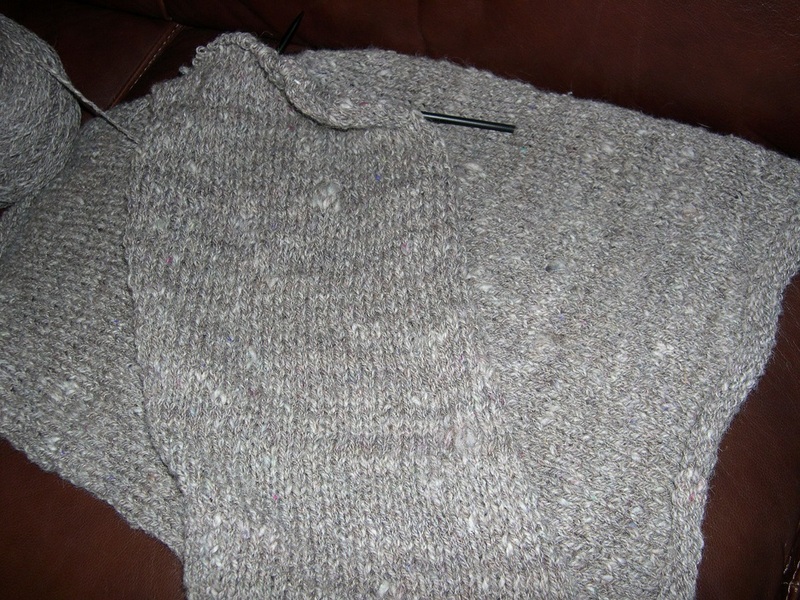 I didn't know the knitter, and I certainly would not have done it myself on such skinny little needles! 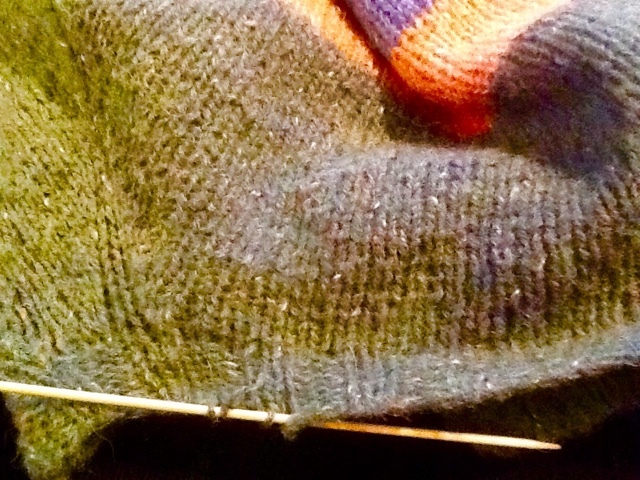 Even before I had twins, I did not have patience for this kind of teeny weeny stitches in a dark color. However, it is well worth saving. I'm already looking forward to how I will use the rest of the yarn leftovers (doubled, in the case of the Donegal lambswool, of course) but mostly, I feel a profound sense of connection. 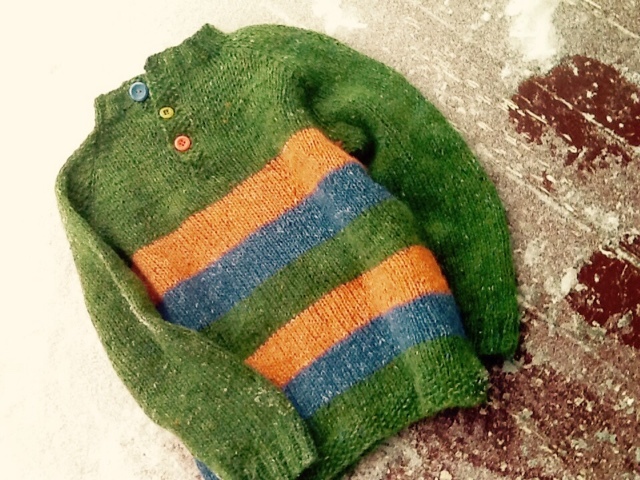 Throughout history, we anonymous knitters have created all sorts of clothing and works of art...and we've left plenty of UnFinished Objects (UFOs) behind. My mom has willingly finished things for other knitters who have passed away and therefore have not been able to it themselves...a baby blanket, a grandchild's afghan, etc. Now, I have joined the ranks. I hope that in that great knitting group in the cosmic beyond, somebody sees this one and smiles. It goes without saying, too, that I hope one day someone will cherish my leftovers, and do the same for me.